What marvelous timing! The Forth Bridge is granted World Heritage status only a couple of weeks before the start of The Forth Bridges Festival 2015. Timing is everything! Queensferry Ambition, supported by the Community Food Fund has put together a of events that will appeal to all ages and will help highlight the marvelous 125 year history of the Forth Bridge and the mark it has made on its new world stage. We have already had a superb build up to the main part of the Festival with charity abseils and the Queensferry Community Markets. 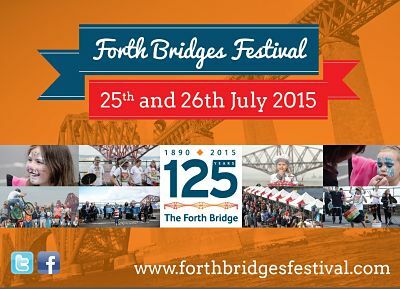 However, the Festival will really come to life over the weekend of July 25 and 26 when we celebrate the anniversary of the bridge with a Family Fun weekend of events and a packed programme of entertainment. Finally, check out the new Visit Queensferry website www.visitqueensferry.com which has been funded by Queensferry Ambition and if you plan to visit the Festival could we encourage local residents if possible to walk to the events due to restricted parking available. Take part in the Chest Heart & Stroke Scotland Forth Bridge 125th Anniversary Abseil and celebrate this famous bridge’s 125th Anniversary whilst supporting Scotland’s Health Charity. This experience of a lifetime allows you to abseil 165 ft from the Forth Rail Bridge – nominated for world heritage status – and be congratulated with exclusive Forth Bridge 125th Anniversary Certificate and Collectable.Abseils are taking place in South Queensferry on 21st June and 18th October.